What the heck is a Lip Cushion? It’s a sweetly scented tinted lip gloss infused with evening primrose, beeswax and aloe vera. It’s also JELLY PONG PONG's newest addition to their super fun line. Available in a sheer berry called Crush and transluscent red called Syrup, they will hopefully expand the line of flavors. $10 @ jellypongpong.com. I love that their Venus Pearls ($20) from the same collection can be used like fingerpaints. Well fingerpaints of powder. So would that be powderpaints? Use these little beads of color to highlight and emphasize your favorite features. Simply swirl your fingertip into the cup o’ colored dots and apply to lids, under the brows, cheeks, anywhere really. My pick is the one shown here, Worship. The outside of the pearls is pure gold and inside is African maroon. Try each of the five shades to create a unique look. 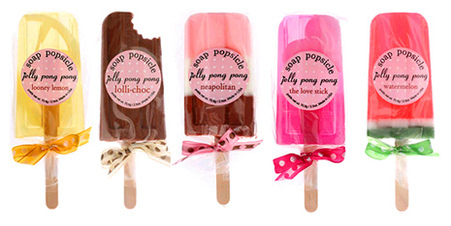 Check 'em out @ jellypongpong.com. JELLY PONG PONG has something super special for the shoe fanatic! Whether you favor flats or high heels, you’re going to love their new Shoe Palette ($9) from the One Swipe And Go Collection. I tried and love Vertigo Stiletto and Plush Pumps, which is an eye shadow and lip duo in a magnetic pink case with a mirror for easy applications on the go. The bronze shadow in the Vertigo seems to work better for my eyes as it really makes my blue eye color appear bluer! And did I mention how tote-able it is? Chic Shine ($19), another product in this collection, is quickly becoming my other favorite. It’s a duo of matte blush and sheer gloss in a teeny easy to pack case with an inside mirror for touch ups on the go. I’m using Ballerina with a pink blush and sheer pink red gloss. A perfect pairing! Be sure to check out the other colors as well because they are winners. All @ jellypongpong.com.